Alibaba is well known for the great volume of fake products from China. Lower quality and much lower prices. Products like Gucci, Ferrero, Nike. You name it. If you want to buy these products, do you know where to find them? Tadadadada……. Drumms…… It’s on AliExpress and Alibaba. OMG am I promoting fake products from China now? No, I’m not. Importing counterfeit is illegal in most countries. If you custom finds counterfeit in your packages, it will probably confiscated. If you order larger quantities, you will probably get a fee too. I mention AliExpress and Alibaba because these sites are well known for the unlimited variety of products. And it is Alibaba, the Chinese ecommerce giant, who starts an offensive against this counterfeiting. Together with the Israeli startup Visualead they have created a new kind of QR-code. To promote the code Alibaba has a partnership with L’Oreal and Ferrero. Alibaba created what it’s calling dotless visual codes. The codes is like a traditional QR codes with patterns of dots in all four corners. But Alibaba’s version has something extra, it can include images in the middle of the code. The code can also be used to verify that a product is original. It can als be used on product packaging, social networks, website authentication, mobile payments, coupons codes and ticketing. When you receive your order, you scan the code on the products using Alibaba’s Taobao app to confirm the product is authentic. Great… Is it! Or… Isn’t it? Is it impossible to buy fake products from China now? Surely not. This QR-code gives you as buyer some security that you bought the real stuff. And only after you have received the product. 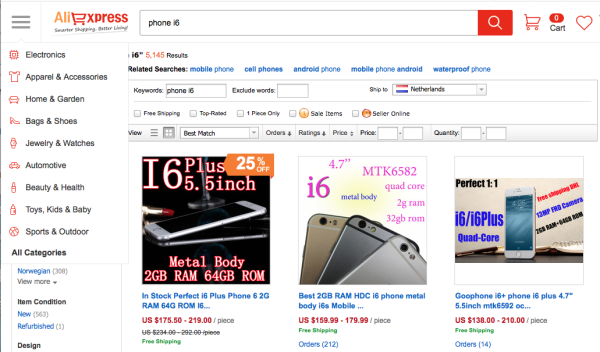 Imagine you buy a iPhone 6 at AliExpress for 175 dollars. After you have received this phone, you scan the code and you find out it is fake. Are you surprised? I don’t think so! And now you got the iPhone, but there is no code (and there will be none). How do you check it? So this code is only a proof you got a real product IF you got the real product. In my opinion it does almost nothing to the real counterfeiting. Alibaba has got a lot of complains about not doing enough against fake products from China. This QR code must proof Alibaba takes this problem seriously. It also gives a lot of new exposure for Alibaba. Their new QR code can be placed on all products worldwide. How often do you scan a QR code? Once a day? Once a month? Once a year? Never? There is no real use. QR codes are being used less and less. Can you buy real non-Chinese products in China? I wrote a whole blog post on this subject. I recommend to read this post. It’s still up to date! Do you think this new QR code will lower the number of fake products on AliExpress? Please write your comment in the box below. And don’t forget to like this article! Thanks. 4 replies to "Buying fake products from China"
I agree! Thank you for your comment.